Dirty Tricks at Play in Ohio Congressional Race? In the long political tradition of “ratfucking,” one favored game is to carve votes from your political rivals by propping up an alternative candidate that might be appealing to their supporters. We saw a little of this when russian trolls promoted Bernie Sanders and later Jill Stein alternatives to Hillary Clinton to suppress votes for the Democratic nominee against her Republican rival. In 2012, liberal allies of Montana Senator Jon Tester paid to run television ads for the Libertarian candidate, nudging the Democrat incumbent ahead of his Republican rival. This week we discovered a possible case of ratfucking that involves an Ohio Congressional District. Facebook ads from a new, mystery group have started running promoting the candidacy of Green Party candidate Joe Manchik in Ohio’s 12th Congressional District — the closest and most at-risk Republican seat in the state. 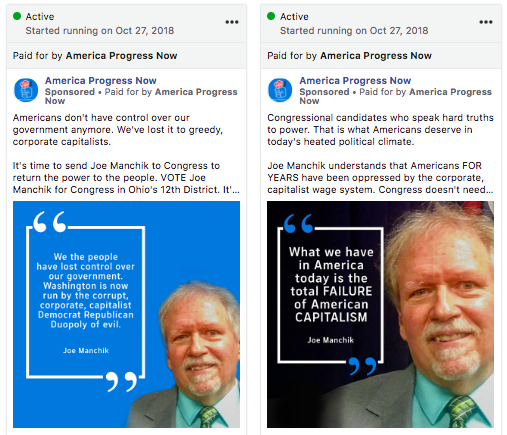 The group in question — American Progress Now — created a Facebook page two weeks ago, on October 15, and on October 27 began running Facebook ads promoting Manchik, targeting them geographically into the Ohio district. The ad buy is not large — Facebook estimates the ads have been seen by between 2,000 and 10,000 individuals and the spend has not exceeded $200 to date. What’s interesting is the group is not only supporting Manchik. 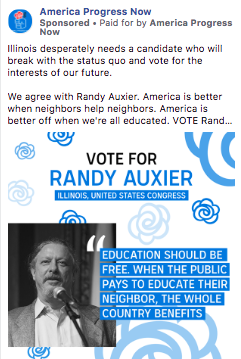 They are also running Facebook ads for third party candidates in other tightly-contested races in a handful of districts across the U.S. (view all the ads in Facebook’s political ads archive). 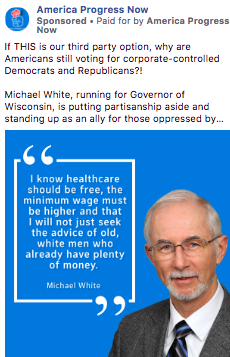 Running for Governor of Wisconsin, a hotly-contested race with a Democrat seeking to unseat Scott Walker. 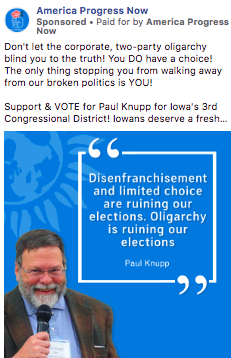 Paul Knapp is running in the ultra-competitive Iowa 3rd district. There are hundreds of candidates running on the Green Party line across the country, including dozens running for Congress. So why only these? 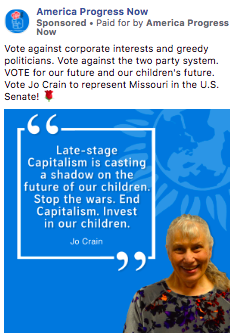 Is it a genuine fan page for green party politicians that just has very narrow tastes? Is it a Republican effort to steer votes away from Democrats in close races? Is it the Russians? The point is, we don’t know. No information is available about America Progress Now. Their Facebook page has no contact information and doesn’t link to a website. There is no organization registered to do business in New York under that name, and no political action committee registered with the FEC. It’s possible the entity is a newly-formed political action committee which will not have to file its expenditures until after the election if they are small enough. If it’s a corporation, it may never have to file anything. But we don’t know what it is. Combined with campaign finance laws that allow entities to shield the identity of their donors and do not require other types to file expenditure reports, Facebook Transparency tools add to the lack of transparency. 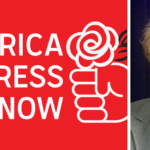 We don’t know who is behind America Progress now, where they are located, who formed the group, who is funding it or how much they are spending on politics. But it would be really nice if we could.